Mankind has always been fascinated with deer antlers. In primitive societies, deer antlers were considered a sign of power and were often used in religious ceremonies and other special events. In some tribes, hunters who harvested the biggest and most animals were held in high esteem with some eventually becoming tribal chief. Even today, deer antlers and trophy deer hunters are held in high regard. Everyone is familiar with the displays of large antlered bucks in hunting magazines and the adulation bestowed on the fortunate hunter. These stories have rekindled the spirits of many a hunter after countless hours in the woods. There isn't a hunter who hasn't dreamed of harvesting a 10-point buck with a 20-inch inside spread and having his buck entered in the Pope and Young record book. One of the largest set of antlers that I ever saw was in Morgantown, West Virginia. A good friend of mine, Rev. Dr. Stacy Groscup, invited me over to his home for an afternoon of target practice with one of his many long and recurve bows. During the shoot, Stacy was actually shooting the flowering heads off dandelions. As evening fell upon us, he started shooting lightning bugs out of the sky. Needless to say I was in the presence of a truly gifted and spiritual man. After practice, Stacy asked me if I wanted to go inside and see a photograph of a large buck and his original Ishi bow (made by the last wild American Indian). Once inside, I was amazed to say the least. There on the wall was an old 8" x 10" black and white photograph of a "creature" (below). The buck's rack was enormous with too many points to count. I remember mumbling something under my breath and then asking several questions, such as were did he shoot such a magnificent buck? What did it score? Where is the mount? Stacy smiled and showed me an article written by noted bowhunter, Gene Wensel, who attempted to score the buck using the photograph. Based on Gene's best guess the buck would score about 323 points and would potentially be a new world record for non-typical whitetails. Stacy informed me that other articles written about the buck had suggested that the buck had been fabricated and was a fake. Stacy stated that this was simply not true and that deer was indeed real and he could prove it! In fact, Stacy's brother Jim Groscup who was stationed at Kelly Field in San Antonio, Texas, during World War II actually saw the deer. While stationed at Kelly Field, Jim Groscup would frequently visit a local taxidermist, named Alex Schleyer. Jim was a fellow taxidermist and he and Alex would trade helpful hints. One day, a young man walked into Alex's shop and asked if he wanted to buy a 65-point buck. Alex grinned and said, "Sure, why not", and offered the young man $50.00. The following day the young man returned to Alex's shop with the biggest set of antlers he had ever seen. The antlers were immense! Although the aged shellac had colored the antlers black, it did not hide the enormity of the rack. This was truly a unique and unusual animal. Alex cleaned and remounted the antlers onto a fresh hide. The restored mount hung in Alex's shop until his death in the 1950's. Back then, Alex probably had the largest collection of trophy whitetails in the Nation. Alex's grandson, Ed Schleyer, a third generation taxidermist told me that his grandfather's passion was to mount huge whitetails and display them in his saloons. Also noteworthy is the fact that Ed's grandfather was one of the major contributors to the Lone Star Brewing Company deer collection. Photo caption: Many hunters have tried to say this buck was fake. New information from two individuals who saw and handled this buck has stated this buck was authentic! Is this a new world record non-typical whitetail? What do you think.. Real or Fake? Upon Alex's death, he had an agreement to give or sell the mounted head to a rich Texas oil man. Story has it that the Texan had an impressive collection of longhorn steer heads and deer mounts in his home. When the old man died he willed everything to his niece who hired two workers to throw her uncle's trophies into a landfill outside of San Antonio. There in the bottom of the dump is the final resting place of this magnificent buck. Knowing the Groscup brothers as well as I do, there is no doubt the deer was real. The black and white photograph even has the name of the studio on the back of the original picture. Also, Ed Schleyer vividly remembers as a young boy the magnificent buck hanging in his grandfather's taxidermy shop. Many hunters still question the authenticity of the buck and argue that a "real" buck could never have developed so many pointed drop tines. These skeptics need to be reminded of the former non-typical, world record whitetail shot by Jeff Benson in Texas. 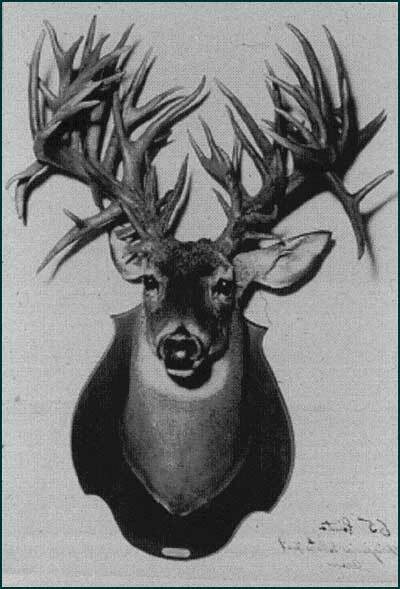 The Benson buck had 78 scorable points, many of which were indeed pointed. Besides, what would be gained by such a hoax, and how could someone fabricate such a set of antlers? Plastic was certainly not used to create the antlers, because plastic was only an emerging technology in the 1940's. In the 1940s, deer hunting was not commercialized as it is today and there wasn't the monetary incentive to have your picture plastered on the cover of some outdoor magazine. Hunting was more a way of life. It provided a means of putting food on the table and maintained the bond with our forefathers. Success in the 1940's wasn't necessarily measured in terms of antler size and it certainly didn't bring instant notoriety and product endorsements. 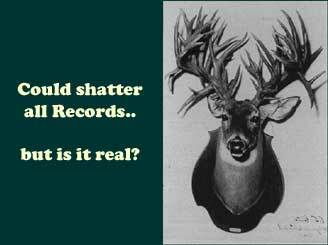 Unfortunately, times have changed and all to often we read or hear about some "hunter" claiming to have shot a record book buck, only to discover it was a fake ... or worst, it was poached. Recently, I read that some "hunter" had had the good fortune to harvest a Boone and Crockett buck (score 170 or better). A buck in this class is literally one in a million. Upon further investigation, however, it was discovered that the antlers were fake and were actually reproductions purchased from a nationally known taxidermist and mounted on a fresh hide. This isn't the first time something like this has happened. Others have tried to use replicas in big buck contests to win large cash prizes. Still others have tried to use last year's big buck contest winner to fool unsuspecting judges. It amazing how far some people will go to fulfill their personal greed. With all the hoopla over big antlers, the synthetic antler market has found a place within our sport. Putting aside any morale or ethical questions, one thing is certain, replicas are here to stay. The good news is that research has caught up with these so-called hunters. Biologists can now remove a small bone fragment from the base of the antler and analyze it for a specific protein. Depending on the amount of protein present, biologists can determine if a buck was actually shot in the year that it was entered in a trophy buck contest. This technology has been successfully used to eliminate questionable entries in the official record book of West Virginia. It would appear that crimologists and forensic scientists have found their way into the deer antler world. Other research on antlers has been conducted by Dr. Robert Brown with the Caesar Kleberg Wildlife Research Institute in Kingsville, Texas. Dr. Brown believes that his research will eventually lead to a cure for osteoporosis; a disease that depletes minerals deposits in the human skeleton. The disease afflicts 25% of all Caucasian women over the age of 50 years. Dr. Brown is investigating the physiological similarities of bone depletion in humans and antler growth. In order for a buck's antlers to develop properly, minerals stored in the buck's skeletal system must be depleted for antler development. The ribs and sternum are the primary sites for this depletion and become quite frail. Needless to say, antler development requires a great deal of energy, as evidenced by the fact that antler growth can be more than 1/2 inch per day! Once the antlers have fully formed, the minerals deposits in the body skeleton are restored. This is why bucks become so docile during the summer time period. They don't dare fight or even spar with their developing antlers. Bucks defend food resource areas by adopting behavior like does. In other words, they become "girly men" and fight like does standing on their hind legs and flailing with forelegs at their opponents' head. It's interesting to note that deer researcher; Dr. Anthony Bubenik believes this is when dominance behavior is decided, not later on during the pre-rut when bucks have hardened antlers.